15th October is globally celebrated Global Handwashing day in theme of Make Handwashing a Habit to increase awareness and understanding about the necessity of handwashing. On that day, School For SDG4 arranged program in collaboration with Rotary Club Sylhet International University. Arond 15 volunteers joined to make the program successful. The day was good learning session for children as they also participated to wash their hand practically. Around 25 children has participated in the Campaign. 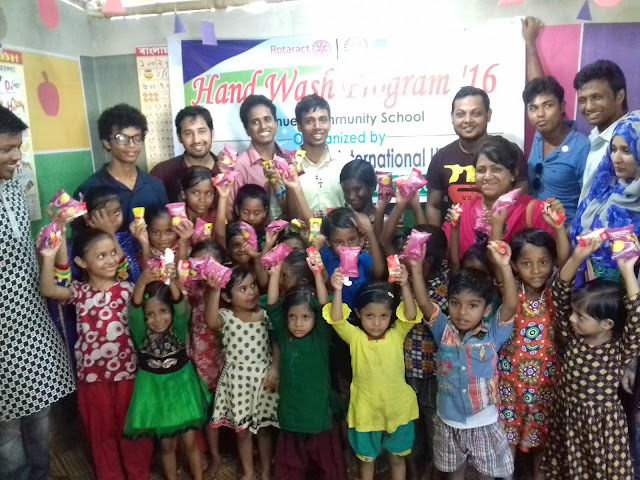 Each of the children got a shoap after the hand washing practical program. They had much more attention to learn about health tips from guests. Why you should wash your hand? Your hands are the major pathways of germ transmission during health care. For this reason, hygiene of hands are the most important measure to avoid harmful germs and prevent deseases. Such Awarness and understanding about necessity of Handwashing will help children to make successful the theme "Make handwashing a Habit" . School For SDG4 should give thanks to all people who worked to make the program successful and effective.